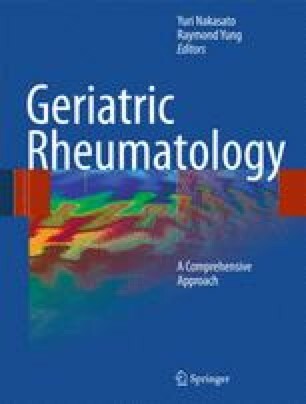 Therapeutic choices for antirheumatic therapy for an elderly individual are influenced by expected pharmacokinetic and pharmacodynamic changes seen with healthy aging, the accumulation of pathologic conditions, and resulting concomitant therapies that pose potential risks of adverse effects or drug interactions. Clinicians should expect an age-related gradual reduction in renal clearance and reductions of oxidative metabolism of select medications. Alterations in the concentration of serum proteins and use of interacting drugs may cause changes in the distribution and binding patterns of some drugs. Some rheumatologic agents carry specific risks in the elderly individual, and specific care must be taken to avoid negative consequences in these individuals. Acetaminophen (APAP), nonsteroidal anti-inflammatory drugs (NSAIDs), opioid analgesics, and corticosteroids may provide symptomatic relief while waiting for a disease-modifying antirheumatic drug to reach full effect. APAP provides a safe and well-tolerated option for the pain of osteoarthritis, but daily doses above 3,000 mg should be avoided in the elderly population. Use of a cyclooxygenase-2 (COX-2) selective NSAID or a nonselective NSAID plus a gastro-protective agent is recommended in elderly people to reduce the risk of NSAID-induced gastrointestinal toxicity. All NSAIDs may increase symptoms of congestive failure and renal insufficiency, and raise blood pressure. Some authors suggest the use of a nonselective NSAID over a COX-2 selective agent in the elderly people due to concerns of ischemic heart disease, but the relative risk is yet to be determined in this population. Disease-modifying antirheumatic drugs and biologic/immune-modifying therapies can provide benefit to the elderly individual, but with potential risk of significant adverse events. Individualization of therapy and dosages is crucial when initiating any new therapy. Any benefit must be weighed against potential risks that may be significant in this population with reduced physiologic reserve. The philosophy of ‘start low and go slow’ should be the basis for any therapeutic intervention. Therapeutic Research Faculty. Glucosamine hydrochloride monograph. Natural Medicines Comprehensive Database. http://www.naturaldatabase.com (2008). Accessed 10 Sep 2008.